The leading causes of infant death have not much changed in resent years. There are some things that even with the new technology we just are not capable yet of preventing. in fact, based on a data table located in the article "infant death --- united States 2000---2007", the rate of change that occurred was only three percent decline. while some of them are beyond our control there are still some precautions that can be taken to decrease the chances of the event occurring, therefor decreasing the chance of the child's death however slightly. The top ten causes of infant deaths are the same now as they were in 2000. They are; Congenital malformations, deformations and chromosomal abnormalities, disorders related to premature birth, sudden infant death syndrome (known as SIDS), newborn affected by maternal complications of pregnancy, accidents (unintentional injuries), newborn affected by complications of placenta, cord and membranes, Respiratory distress of newborn, bacterial sepsis of newborn, neonatal hemorrhage, and diseases of the circulatory system. Congenital malformations, deformations and chromosomal abnormalities is first on our list. Most often this is called birth defects. while these can range from mild (cleft lip, palate) to severe (down syndrome, heart defects) some are so severe to cause death. "In 2005, 5,571 infants died as a result of congenital defects." (Leading causes of infant death). As of now, we don't really know the cause of birth defects, but we have found some things that increase the risk. Drinking, smoking, and drug use can increase the risk of birth defects. Sometimes it is not even that you smoke, but that those around you do so heavily in a closed off space. Some medicines can also increase the risks, that is why it is best to consult your doctor before taking a new medicine, or existing medicines in the event of pregnancy. Premature birth is also a leading cause of infant mortality. although we can now save some inf ants that are born early because of an increase in knowledge and medical equipment, if they are born to early there is just nothing we can do. 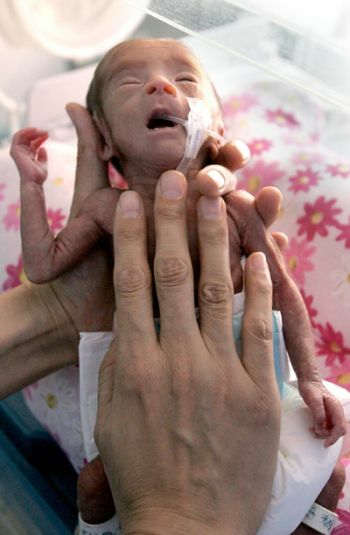 premature birth is considered below the thirty-seventh week of gestation. High risk of mortality is usually at the thirty-second week or earlier (Causes of death) This is another one where no one really knows why it happens. about half seem to have no cause. it is believed that high stress or injury can induce labor before the time. "In 2005, 4,698 infants died as a result of preterm birth or low birth weight: (leading causes of infant death) A premature birth results in a small, underdeveloped infant whose lungs don't work of there own accord, their brains often haven't finished developing and are highly susceptible to illness. Those that live through it may have health issues later such as blindness, cerebral palsy, major problems eating or breathing, and developmental delays. Sudden infant death syndrome is unexplained, sudden death of infants under the age of 1 year old. No noise is made, its just like the baby fell asleep and never woke up. There are some risk factors for SIDS, but the impact or importance of each factor is not well-defined or understood. SIDS risk factors include: sleeping on the stomach, being around cigarette smoke while in the womb or after being born, sleeping in the same bed as their parents (co-sleeping), soft bedding in the crib, multiple birth babies (being a twin, triplet, etc…), premature birth, having a brother or sister who had SIDS, mothers who smoke or use illegal drugs, being born to a teen mother, short time period between pregnancies, late or no prenatal care. Newborn affected by maternal complications of pregnancy can range from mild to sevier. It is hard to determin what symptoms are normal for pregnancy and what symptoms are not. Sometimes it is not even a physical complication, but a phycological one that can endanger the life of the infant and/or mother. Many conditions are mild, and do not progress; however, when some conditions do progress, they may place both the woman or her baby in danger. "In 2005, 1,769 infants died as a result of maternal complications." (leading causes of infant death). A lot of infant deaths also happen from accidents. Baby's are dropped, or find small things to choke on, catch a too severe cold or virus than can be treated and other things. However, it is not just what happens to the baby itsself. A pregnant woman in an accident can loose the baby, or cause harm that will last the childs lifetime. It is imparitive to be carefull when pregnant or when caring for your child. Newborns affected by complications of placenta, cord and membranes can cut off blood and food to the baby, wrapp aroung the neck to restrict oxygen, and cause other harmful deadly complications. The placenta is an organ inside the womb that supplies the fetus with the blood supply and nutrients necessary for survival. The umbilical cord connects the mother with the growing fetus at the placenta. The umbilical cord brings oxygen and nutrients to the fetus and takes away waste such as carbon dioxide. complications in either of these can be deadly to the baby and harmful to the mother. Umbilical cord and placenta complications accounted for 1,095 infant deaths in 2005. Respiratory distress of newborn, bacterial sepsis of newborn, neonatal hemorrhage, and diseases of the circulatory system are also major ones to watch out for. While their body count is not so high, it is fatal. problems with these can often be fast and have little sidefects to give warning to the parent of what id happening. Because an infant has such a small imune systen it is harder to fight off the things that give children and adults the sniffles and can be life threatening to the baby. Bacterial sepsis spreds throughout the body and causes pain iritation and death. So there are many things that can happen to an infant, many that can not be prevented, but the risk can be reduced. It can be sudden, gradual, or prolonged. We can only hope that in time we can find a way to stop these occurences from happening, and save the lives of our little ones. Machintos, Andrew. "Why Infant Mortality Rate Increased from Year to Year." Health Information Tip Â» Blog Archive Â». Health Information Tips. Web. 03 Apr. 2012. Syndrome. U.S. National Library of Medicine, 18 Nov. 0000. Web. 04 Apr. 2012. Board, A.D.A.M. Editorial. "Causes, Incidence, and Risk Factors." Down Syndrome. U.S.
National Library of Medicine, 18 Nov. 0000. Web. 04 Apr. 2012. MacDorman, Marian F., and T. J. Mathews. "Infant Deaths — United States, 2000–2007." Centers for Disease Control and Prevention. Centers for Disease Control and Prevention, 14 Jan. 2011. Web. 16 Apr. 2012. - Well-Written (Original) Essay: This essay is very well written, decent length, and well formatted. - Appropriate / Relevant Pictures: The picture choices are both appropriate and relevant. They depict injuries/problems that the infants face which helps break up the text and add visually appealing breaks in the essay. - Formatting (Text & Pictures): The formatting was very nice, easy to read, and the pictures helped break up the wall of text. - Working Links: All the links appear to be in working order and they seem appropriate as well as informative. - Visually Appealing: This essay is visually appealing due to the format of the paragraphs along with the pictures that help break up the text. - Good Labels (i.e. “baby, babies, SIDS, causes, facts, medical”): The labels seem to be related to the subject very well. - Recommendations for making the essay better (spelling, grammar, pictures, facts, etc. ): I might change the format/layout of a couple of the pictures, but I don't know that I would change anything else. - How did the essay change your views about the topic? This essay helped provide insight and information that helped me understand subjects that I had not prior knowledge about. Choice Of Topic: Informative and Relevant. Appropriate:School appropriator and subject related. Formatting: Excellent. Related pictures, and easy to read. Visually appealing: Well appealing, no, but good and related visuals, yes. How did this change your views about the topic: It didn't really "change" my views, but it did provide me with interesting information. Choice of Topic: Good choice!! How did the essay change your views about the topic? I didnt know that babies die this way so often.